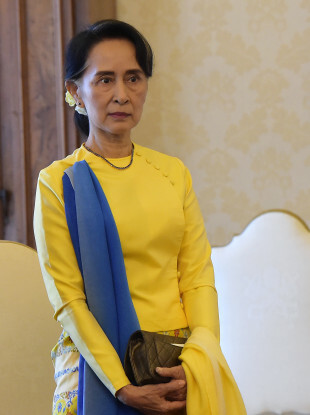 Aung San Suu Kyi during a visit to Rome in her role as foreign minister. MYANMAR’S LEADER AUNG San Suu Kyi has finally broken her silence on the Rohingya crisis – alleging that a “huge iceberg of misinformation” was distorting the picture of what was happening. Violence in western Myanmar has forced 125,000 of Rohingya, a Muslim minority, to flee to Bangladesh. Survivors of the violence have said that adults were being burned alive and children beheaded. Aung San Suu Kyi is a Nobel Peace Prize winner who spent 15 years under house arrest for her pro-democratic political views. During that time, she was given the option of leaving the country on the condition that she never return, but refused out of solidarity with her country and its people. This won her the respect of Myanmar’s citizens, and foreign diplomats around the world. In light of this, some people expressed shock that Suu Kyi hadn’t spoken out against the atrocities of the minority Muslim group. A fellow Nobel laureate Malala Yousafzai said that the “world was waiting” for a statement from her on the abuses being reported. Turkey’s president Recep Tayyip Erdoğan, who’s spoken to Suu Kyi about the crisis, has repeatedly called the abuses a “genocide”. In her first comments since Rohingya militant attacks sparked unrest on 25 August, Suu Kyi was quoted by her State Counsellor’s office as saying fake news was “calculated to create a lot of problems between different communities” and to promote “the interest of the terrorists”. “That kind of fake information which was inflicted on the deputy prime minister was simply the tip of a huge iceberg of misinformation calculated to create a lot of problems between different communities and with the aim of promoting the interest of the terrorists,” a statement said. Her comments have coincided with the news that at least five children were killed when several boats carrying Rohingya refugees from Myanmar sank early this morning. “So far, the bodies of five male and female children have been found at different locations,” Border Guard Bangladesh officer Alyosius Sangma told AFP. Protests outside the Myanmar embassy in Indonesia have already taken place last night – it’s likely that the comments from Suu Kyi and the worsening crisis are only going to increase tensions in the area. Email “Aung San Suu Kyi finally speaks on Rohingya crisis, blames false information”. Feedback on “Aung San Suu Kyi finally speaks on Rohingya crisis, blames false information”.